Phosphorus is a mineral that is important for healthy bones. Adults with XLH have too little phosphorus, leading to weakening of their bones. In Study 3, adults with XLH were given either CRYSVITA or a placebo (an injection that did not contain any active medicine) every 4 weeks for 24 weeks, and the amount of phosphorus in their blood, described as “serum phosphorus,” was measured. In a study of adults with XLH aged 19 to 66 years (Study 3), 68 adults received CRYSVITA and 66 adults received placebo every 4 weeks. *Normal levels of serum phosphorus for this group of patients ranged from 2.5 to 4.5 milligrams/deciliter (mg/dL). The normal range of serum phosphorus varies by age and gender. At baseline, both patients in the CRYSVITA and placebo groups had phosphorus levels below the normal range. After 24 weeks of treatment with CRYSVITA or placebo every 4 weeks, there were more patients who achieved phosphorus levels within the normal range in the CRYSVITA group than in the placebo group. Talk to your doctor about how CRYSVITA can help increase and maintain normal serum phosphorus levels. In adults with XLH, ongoing osteomalacia can result in what’s called “low trauma” fractures or pseudofractures. Pseudofracture is a kind of fracture where the bone thickens at the site of an injury but is not completely broken. These symptoms can manifest as a result of bearing weight on weak bones. In a study of adults with XLH aged 19 to 66 years (Study 3), 68 adults received CRYSVITA and 66 adults received placebo every 4 weeks. At the beginning of the study, there were 65 total fractures in the CRYSVITA group and 91 total fractures in the placebo group. During treatment through Week 24, a total of 6 new fractures or pseudofractures appeared in 68 patients in the CRYSVITA group, compared to 8 new abnormalities in 66 patients in the placebo group. *Total fractures were defined as active fractures and pseudofractures combined. Talk to your doctor about how CRYSVITA can help with fracture healing. Under normal conditions, minerals like phosphorus are continuously added to bones. This process, called “mineralization,” helps to keep bones hard. People with XLH don’t have enough phosphorus for bones to properly mineralize, which causes some parts of the bone to become “soft” and more likely to break. “Softening” and weakening of the bones is called osteomalacia. In a study of adults with XLH aged 25 to 52 years (Study 4), small samples of bone were taken and examined for signs of healing of osteomalacia. 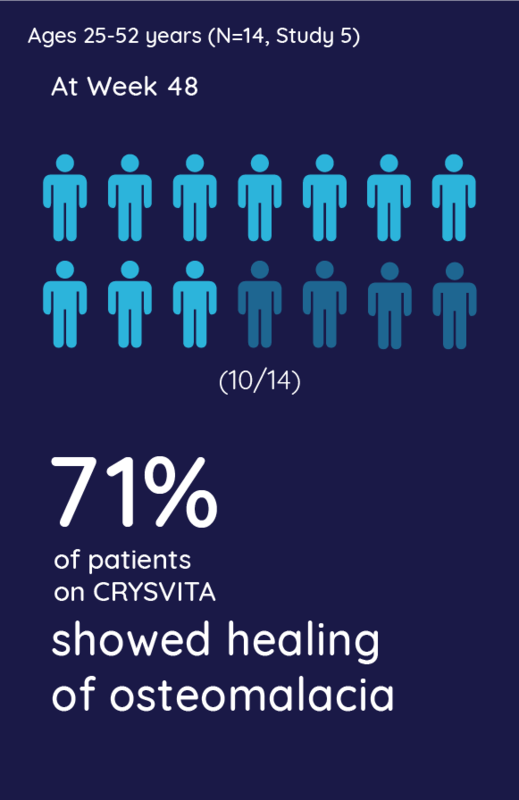 Bone samples were taken before patients started treatment with CRYSVITA and then again after the patients were treated with CRYSVITA every 4 weeks for 48 weeks. In Study 4, 14 adults with XLH aged 25 to 52 years received CRYSVITA every 4 weeks. Healing of osteomalacia was observed in 10 out of 14 (71%) patients. Their bone biopsies showed a 57% reduction in osteoid volume to bone volume, which is a measurement of mineralized bone. Talk to your doctor about how CRYSVITA can help heal osteomalacia. Are you a Healthcare Professional or Patient/Caregiver currently residing in the U.S.? This site is intended for U.S. audiences only. Sign up to receive the latest information about CRYSVITA in your inbox. I would like to receive patient and caregiver information about CRYSVITA from Ultragenyx, and I am a US resident. Sorry, we were unable to process your request at this time. Please try again later. CRYSVITA is a prescription medicine used to treat adults and children 1 year of age and older with X-linked hypophosphatemia (XLH). What is the most important information you should know about CRYSVITA? Some patients developed allergic reactions (rash and hives) while taking CRYSVITA. Your doctor will monitor you for symptoms of an allergic reaction while you are taking CRYSVITA. High levels of phosphorus in the blood have been reported in some patients taking CRYSVITA. This may be related to a risk of high calcium levels in the kidneys. Your doctor will collect samples to monitor your levels. Administration of CRYSVITA may result in reactions at the injection site, such as hives, reddening of the skin, rash, swelling, bruising, pain, severe itching of the skin, and collection of blood outside of a blood vessel (hematoma). What are the possible side effects of CRYSVITA? Narrowing of the spaces within the spine is common in adults with XLH and pressure on the spinal cord has been reported in adults taking CRYSVITA. It is not known if taking CRYSVITA worsens the narrowing of the spaces within the spine or the pressure on the spinal cord. are pregnant, think you may be pregnant, or plan to become pregnant. There is not enough experience to know if CRYSVITA may harm your unborn baby. Report pregnancies to the Kyowa Kirin, Inc. Adverse Event reporting line at 1-888-756-8657.
are breastfeeding or plan to breastfeed. There is not enough experience to know if CRYSVITA passes into your breast milk. Talk with your doctor about the best way to feed your baby while you receive CRYSVITA. These are not all the possible side effects of CRYSVITA. Call your doctor for medical advice about side effects. You may report side effects to the FDA at (800) FDA-1088 or www.fda.gov/medwatch. You may also report side effects to Kyowa Kirin, Inc. at 1-888-756-8657.